Agile is known as the most cost-effective and time-saving methodology that allows vendors to meet their clients’ demand for certain projects. Agile has been gradually used in almost every company by now. Whether you’re working in the IT field or you’re going to co-operate with an Agile software company, you need to have a practical knowledge of Agile methodology. 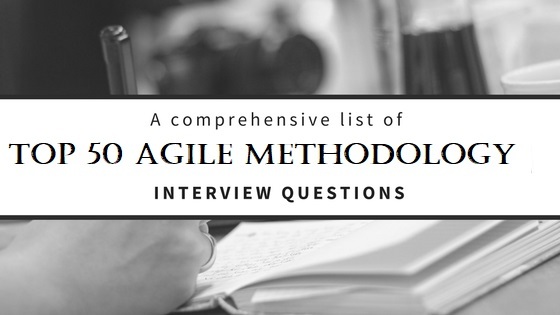 In this post, we have listed the top 50 most commonly Interview Questions about Agile methodology. What are the pros and cons of Agile models? How many popular Agile quality strategies? What are they? What are the distinctive features of each Agile quality strategy? Why should companies enhance Agile software development? How to define Agile testing? What are the distinctive characteristics of Agile development? How to differentiate Agile development from traditional methodology? What are the core values of Scrum? How to distinguish between Agile and Scrum? How long should a Scrum sprint be? What are impediments in Scrum? What is the Scrum ban? What is a story point in Scrum? Explain the responsibility of Sashimi in Scrum? How can Scrum help in tracking progress? What is Scrum master responsible for? What is the role of a Scrum project manager? Explain the primary responsibilities of each role in Scrum: Product Owner, Scrum team, Scrum master. What is the definition of “Agile product backlog”? Why does product backlog play an important role? What are the four characteristics of product backlog? As a product owner, which guidelines should you strictly follow to create the product backlog? Which features that make Sprint backlog different from product backlog the most? What are the advantages of burn-up and burn-down chart? How to describe the approach for determining the iteration length? What is the difference between a QA in an Agile team and in the traditional team? What does DSDM stand for? Explain it. Which environment, industries and projects should we apply Agile methodology to? Which of these advocates the anti-gold-plating mechanism of Agile? What is the importance of Agile testing & stubs? What should be noticed the most to apply Agile methodology successfully in your work? Explain the term "Yesterday's Weather" in an Agile project? What does "Time-boxed" mean in Agile? What does the letter “M” stand for in the popular prioritization technique called MoSCoW? What are the attributes of an Agile team? What you can say about the term “build-breaker”? How do you know about Daily Stand-Up? How do you define Zero Sprint and Spike in Agile? How many core risk areas common to all projects? What are they? To become a good Agile Tester, which skills and qualities are the most important? What does the term “Scrum of Scrums” mean? Is Scrum an Agile framework? Explain why. What are some common Agile frameworks? What are they? What are some common metrics for Agile? Name some key features of each. Agile is considered the most cost-effective and time-saving methodology to apply to a project at this time. Following an Agile method can help software development team to satisfy the customers at earliest while implementing Scrum can power the team to meet every single requirement of the customers for its flexibility. Above are top 50 interview question for Agile. Hope it's useful for you to widen your knowledge of Agile methodology and help you prepare well enough before your job interview. If you have any question related to Agile methodology, please do not hesitate to leave a comment below. Feel free to share your answers to those questions.